Two More Upsets: Stanford Takes Kansas; Kentucky Fells Wichita St. : The Two-Way The Kansas Jayhawks became the second No. 2 seed to be bumped out of the tournament early. Stanford beat them 60 to 57. 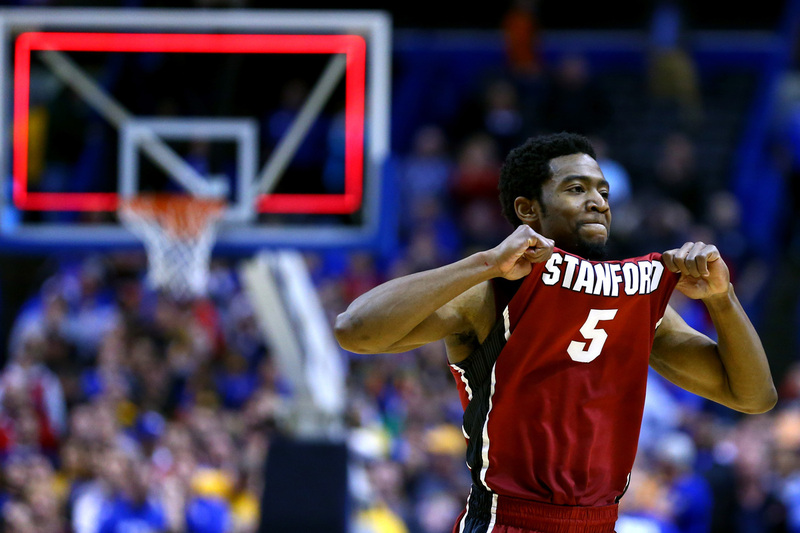 Chasson Randle of Stanford celebrates defeating the Kansas Jayhawks during the third round of the 2014 NCAA Men's Basketball Tournament. The NCAA Tournament has produced another stunning upset: This afternoon, the Kansas Jayhawks joined Villanova as the second No. 2 seed to fall in the round of 32. Kansas lost to Stanford 60-57 on Sunday. "Once again, Kansas struggled to score points with Joel Embiid out. They shot just 32.1 percent from the floor in the first half, but credit to the Cardinal defense, who made things more difficult on the Jayhawks. One of the highlights of the first half was this nasty block by Josh Huestis. "Stanford had trouble finding points themselves, making just 32 percent of their field goals. The Jayhawks woke up towards the end of the half, finishing with a 7-1 run. Connor Frankamp hit a three-pointer at the buzzer to give Kansas a 24-22 halftime lead." The game was tight throughout. Toward the end of the last quarter, the teams were separated by two points. "Stanford, with its big wings and the imposing Stefan Nastic to guard the rim, is now in position to make a run to the Final Four. Up next is Dayton after it slayed Ohio State and Syracuse, so the Flyers won't be intimidated in Memphis by the Cardinal's pedigree. But Stanford is a tough matchup for any opponent because of its diversity. Despite Stanford's size and versatility, Randle, the 6-2 junior, showed in St. Louis that he's the catalyst for this group. As he goes, so goes Stanford. And Randle's proving to be a reliable weapon in March." The no. 8 seed Kentucky Wildcats sent the no. 1 seed Wichita State Shockers home, winning Sunday's game 78-76. "Make no mistake: this was an upset. Wichita State had tremendous and versatile roster and earned their previously undefeated record even with a soft regular season schedule. Kentucky was simply better in the second half on Sunday. March Madness might be all about the underdog, but there's nothing that wins on a basketball court more consistently than superior talent." Kentucky will face their in-state rivals Louisville in the Sweet 16 on March 28.